In wind-swept uplands, just west of Saffron Walden and north of Wendens Ambo, lies a small village once home to thane and freeman, serf and reeve and now but home to none. Strethall by name, the hall on the street, now sleeps silent as pestilence and plague have played among its stones and worms turn bodies into the dusts of time. The king lay at Camelot on New Year’s Day so I, in search of adventure, took le Gringalet and headed north to the Royston Ridge before passing on that ridgeway past the windmill at Great Chishill and past Chrishall again, home – as it has been related – to John de la Pole, an old friend of mine. Here, in olden times, the road wended west to Great Chesterford if you will but now, with the passage of time, old Roman roads have long since lost their significance and Strethall is but a backwater in the book of time… You need to look hard to find it today. But as a young knight, I remember a different place. Once, on this high peak – 400 feet above the datum is high in these parts – Strethall was a vibrant village, vehement and vocal. Strethall then was already an ancient settlement, in existence long before my time and serving Roman and local alike. And when I last visited the place, it still supported fields, oxen, pigs in the woodland and more sheep than I could count; notwithstanding a mill upon the ridge. Alas, nothing of this part now remains. Talking with a friendly local, I was informed that when pestilence and plague blew around the place in the 1340s, the village suffered badly; so much so that not one household lived to tell the tale. 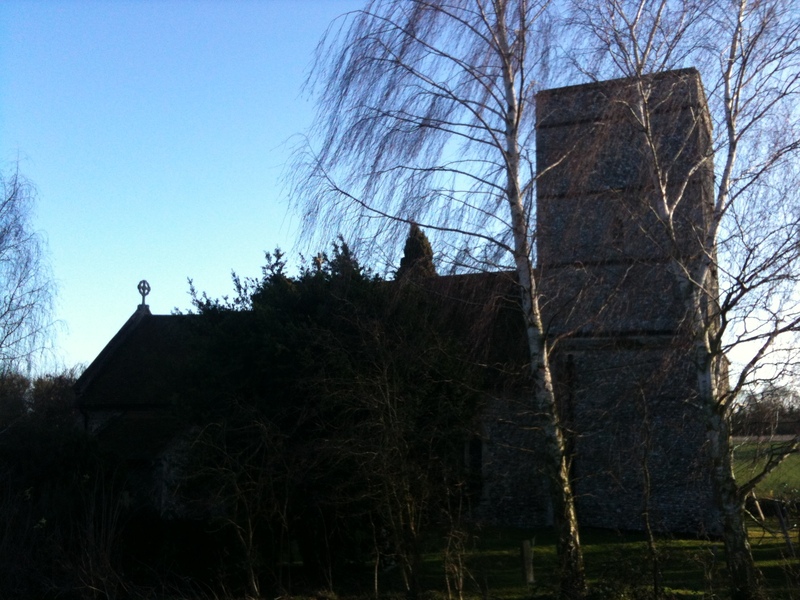 Today, just the church – St Mary the Virgin – stands lonely on the bluff with just a few barns and a farmhouse for company. Yet the church, despite its isolation, is eloquent in its solitude. The tower, simply constructed of flints, is bound by iron to strengthen it against the high winds which blow up in these parts. Apart from the iron straps and some later crenellations, I’d say the place is much as I remember it when William and Alwig – and later Hugh – held the lands for the abbot in 1086. But when you enter the church, if you can scale away the accretions of the years, old stones still sing. The chancel arch is surely, in its simplicity, one of the finest examples of Anglo-Saxon interior arches in a small church anywhere on these islands. Primitive in execution yes, but finely worked notwithstanding. And then there is the wonderful font, unusual and large. I recall this from a visit I made in the 1100s so I can vouch for its age too. The roof however is fairly modern; I would place it, reader, to between 1400 and 1500, trussed with cambered tie-beams and stoutly made from oak. Not perhaps one of the most magnificent of roofs but somehow fitting to this place. Look elsewhere and you will find a thirteenth century piscina, some delightful Fifteenth Century brass work and some pews dating, I should say, to what you would call the later middle ages. I am told by our local friend that this church was on the verge of losing its status as an independent parish in recent years but the locals from the nearby village of Catmere End (which would, it seems, be where a new resurgent community built itself after the Black Death) protested and independence was preserved. So much so, it seems, that just this Christmas this small church, capable of holding 70 in moderate comfort was packed to bursting when nearly 130 worshippers descended on it to give grace to God at Christmas time. Reader, should you seek solace in small things, look to Strethall for your guidance. Despite the monstrous predations of an uncaring world, people in small places can wield plenty of power. The original owners of these lands may now have gone away. But in their spirit and in their deeds they still live on today.